Spring, Texas: February 22nd, 2017: The I-45N traffic nightmare continues as the Texas Department of Transportation continues emergency road repairs after a large hole appeared in the mainlanes of I-45 north this morning. We reached out to officials with TxDot this afternoon and they stated they were hoping to have the repairs completed by 5:00 PM this afternoon, just in time for rush hour. As the time of this posting, road repairs are still underway. According to county officials, the travel time from Downtown Houston to Woodlands Parkway is estimated at 2-3 hours. 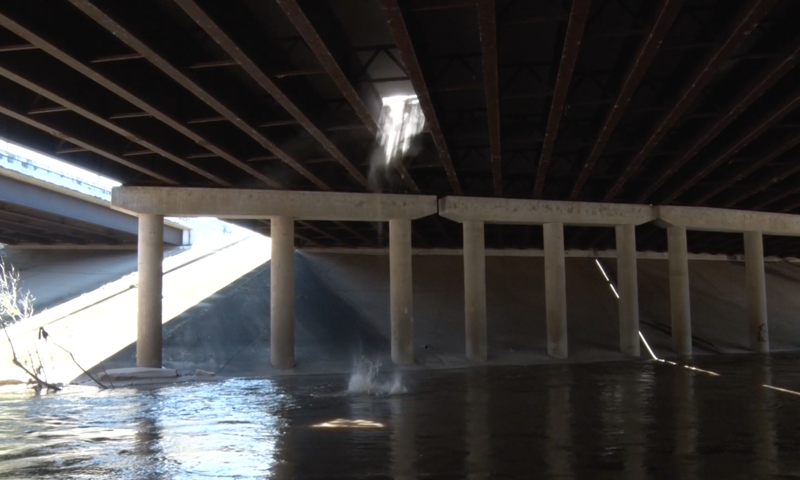 Here is video taken earlier this afternoon of the hole from underneath the Spring Creek bridge. Large chunks of concrete and debris from the roadway can be seen falling into the fast moving water of Spring Creek.